I’ve hit lucky with the weather this year. I’ve just done four nights aboard, which is one of my longest stays , and it was unbroken heat and sun the whole time. Just after the summer solstice, so the sun was up at 5:00am (I know because it shone into the cabin and woke me up ) and down just before 10:00pm, with some spectacular sunsets. I started out very professionally . 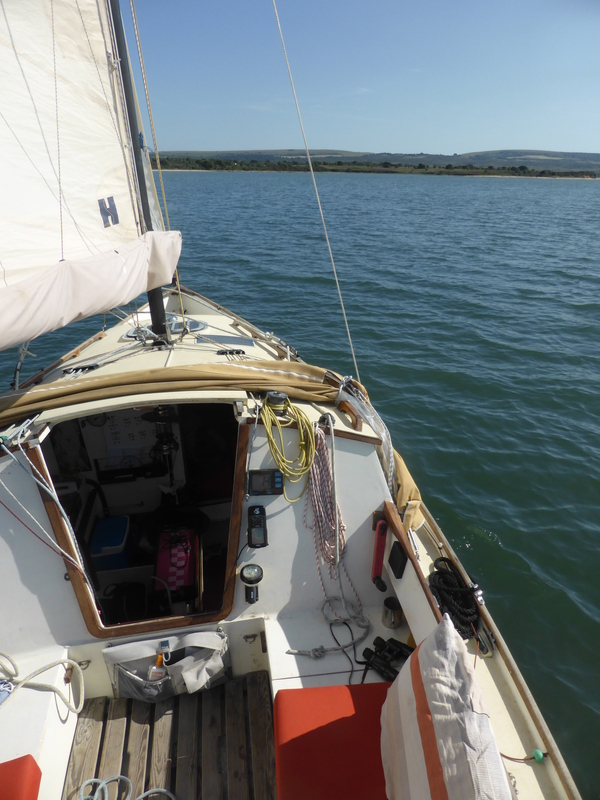 The wind, tide and busyness were just right, so I sailed off my mooring without the engine even ticking over. First time I have actually done that, but it is good to practice for when it is essential. Many more boats out now, with local X boats racing nearly every day as far as I can judge. 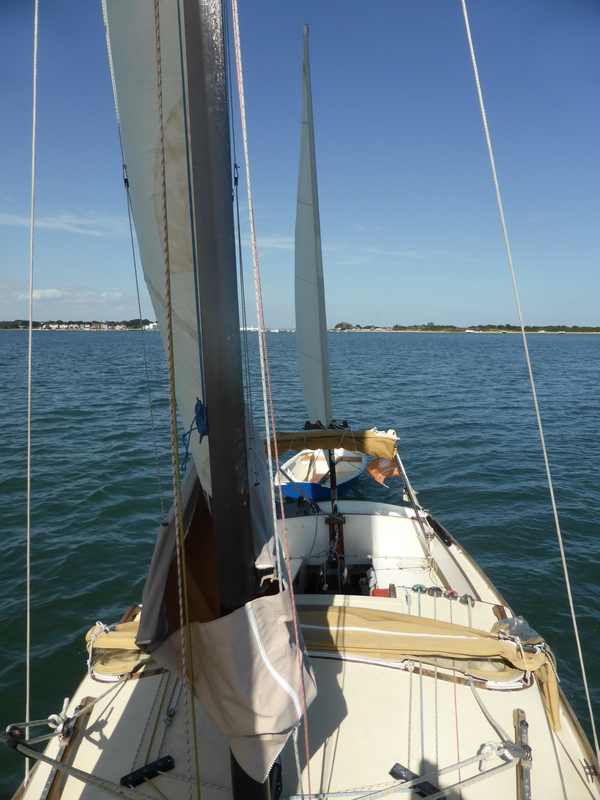 I didn’t sail huge distances, just changed anchorages to alter the view. Sailed out one morning to Studland beach, where everyone was enjoying the sun. Too hot for a beach run but I did a lot of rowing in the shallows, looking at the birds, fish and deer which abound here. 18 inches is not a problem to a small rowing boat. I find I scull with a single oar over the stern most times now, unless the wind is strong or I really need to get somewhere. I used the cockpit canopy a few times, which wasn’t really necessary, but it reduces any dew on the deck in the morning. Getting this photo involved getting up at low tide (5:30am!) and wading out through glutinous mud, but I wanted a record of how well the canopy fitted. And I swam! Several times a day, it was just so pleasant. The water is warm and you just blow dry back on board. I’ve discovered the trick of getting back up a short transom ladder which only projects one rung into the water. I put one knee on first rung, which is easy, and then I can push up with that and get the other foot on beside it . Trying to get a foot straight on is a real contortionist exercise. I also discovered during some very gentle wind, that Daisy G will hold her course so well I can walk about and sit on the stern or the bow, which is really very pleasant in the sun. I wouldn’t do it in any wind, as she would soon sail away if I fell in. My trusty but ancient GPS unit seemed to die for half a day. It just said it couldn’t acquire satellites, and was showing the wrong time, which is unheard of for GPS. But after a few hours it suddenly kicked in again. I don’t want a new one, as electrical wiring is not my strong point. All in all, a wonderful four days in Poole Harbour. This entry was posted in Uncategorised on 27th Jun 2018 by Julian. It’s all lovely, especially in this heat and sun.